1. Cook barley in boiling salted water. Then drain and keep aside. 2. Meanwhile, peel the halved butternut squash, remove the seeds and cut the flesh into small cubes. 3. Heat a pan with 2 tablespoons olive oil. Add squash cubes and cook for 15 minutes over high heat, stirring regularly. Add 2 tablespoons of soy sauce and continue stirring. 4. Add 2 tablespoons of canola oil and cook over medium heat for 10 minutes. Don’t add salt because the soy sauce is already salty. 5. 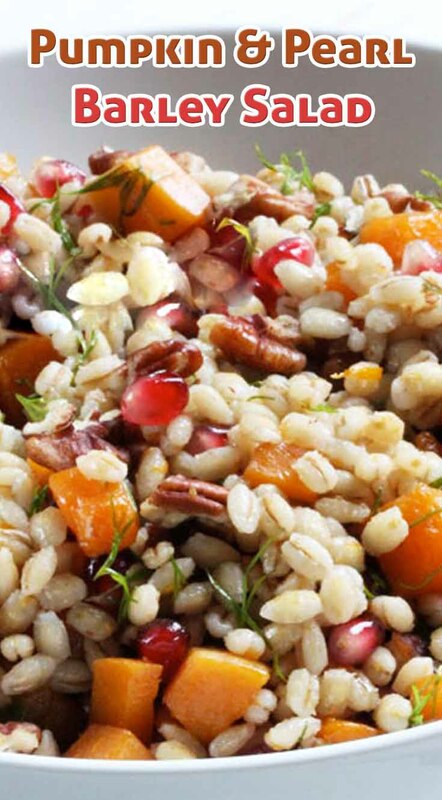 In a large bowl, pour the cooked pearl barley, add the orange zest and juice. 6. Add 2 tbsp oil and the cream of balsamic vinegar. Add the diced squash and half the chopped sprig of dill. Open the pomegranate and collect the seeds by hitting the top with a tablespoon over the bowl. 7. Fry the pecans for 3-4 minutes, chop them coarsely and add to the salad. 8. Mix all ingredients, add salt and pepper and serve warm. Enjoy!